In building a carefully-assembled, detail-oriented plan that would see Olympic bronze medalist Clayton Murphy compete in both the 800m and 1500m in the USATF outdoor championships, both Murphy and his coach Lee Labadie knew that the reigning Olympic 800m bronze medalist - hoping to battle competitors in 5 races over 4 days - would be facing many worthy opponents. But prior to this week, they did not know that perhaps Murphy's most formidable opponent may well be the Weather Gods who have transformed Sacramento into a broiling hell hole fit for neither man nor beast. When Sandi Morris sailed over 5.00 meters / 16'5" in last year's Diamond League pole vault final in Brussels, she became only the third woman in history to conquer that mythical height. It was a clearance that clinched for Morris Track & Field News' #1 world pole vault ranking and was the perfect capper for Morris' 2016 breakout year. It was quite a year indeed for the young South Carolina native who just 4 years earlier was a bundle of unharnessed potential utilizing unrefined technique to clear 4.15 meters / 13'7¼". After yesterday's invigorating opening day of men's track & field competition, it was the women's turn on Thursday to show what they could do under overcast, cool, and breezy conditions at Hayward Field. Action kicked off with the hammer throw. And it didn't take long for the ladies to get their first day of competition off with a bang. Coming to Eugene with an impressive collegiate leader of 72.81m//238'10," Arizona State junior Maggie Ewen - an imposing athlete - stepped into the ring as the strong favorite. After a shaky start on her opening throw, the Sun Devil got it rolling with a beautifully rhythmic heave on her third attempt; a high arching shot that splashed down at 73.32m/240'7" to set a new NCAA championship and collegiate record. "I had been feeling really comfortable about my entry and my coach told me when I get that feeling to really go after it," the champion shared afterwards. Later in the day, Ewen would score 3 more points for the Sun Devils by finishing 6th in the shot put. 6th round scrambling is often the case in these championship field contests and today's hammer was no different. With exceptional final attempts, Northern Arizona's Brooke Andersen [68.62m/225'1"] and Georgia frosh Beatrice Llano [67.42m/221'2"] clawed their way past several competitors to finish 2nd and 3rd respectively. As dusk began to fall over Hayward Field, 24 competitors bounced in anticipation behind the start line just before commencement of the only running event final of the day: the men's 10,000 meters. It was a nervous moment. But all 24 knew one thing: this night they would not be beaten by 17-time NCAA champion Edward Cheserek. When the Oregon star sustained a pesky injury in winning the PAC-12 10,000 which precluded the defense of his 10K national title, speculation was rampant as to how the 10,000 meter final would unfold and who would step up and grab the crown. On the eve of the 2017 NCAA Div. I outdoor track & field championships, Vin Lananna - President of TrackTown USA and Associate Athletic Director at the University of Oregon - was relaxed and smiling as he watched scores of hopeful athletes get their final warmups in at Hayward Field. Fueling his upbeat spirits is Lananna's optimism about the present state and likely trajectory of American track & field. As is the case in virtually every undertaking in life, goal-setting is an essential ingredient for track & field success. The better athletes in our sport reflect upon past accomplishments, assess their fitness level, target their goals, and map out a strategy to achieve them. Yet without the athlete's commitment, the prospects for goal achievement are slim indeed. Studies show that when an athlete does commit, but then also verbalizes and shares the targeted goals with others, it serves to strengthen the resolve of the athlete who has gone public with the dream. Some athletes - who see risk in sharing their goals with others - are coy about their annual or long-range objectives and are reluctant to share their goals with others. Other bolder and more confident track & field performers do not fear publication of what they hope to accomplish and see it as technique to inspire them to employ their best efforts to succeed. Kerron Clement is one such athlete. In 2000, Penn mastermind Dave Johnson concocted a novel plan to incorporate track & field professionals into the Penn Relay Carnival. The idea was grounded upon the concept of a global team relay competition. The United States - the "home country" - would take on teams assembled by other nations comprised of pros looking for an appropriate season opener for their extended outdoor seasons. When the approach was embraced by both USATF and NBC, the threads of both professional track & field and international team competition were weaved into the Penn Relays tapestry. 18 years later, USA vs. The World is a beloved fixture and a critical element of Penn's concluding day. Yellow, black, and green are predominant throughout Franklin Field as roving throngs of Jamaican fans - armed with air horns - help fill Franklin Field on Day Three. 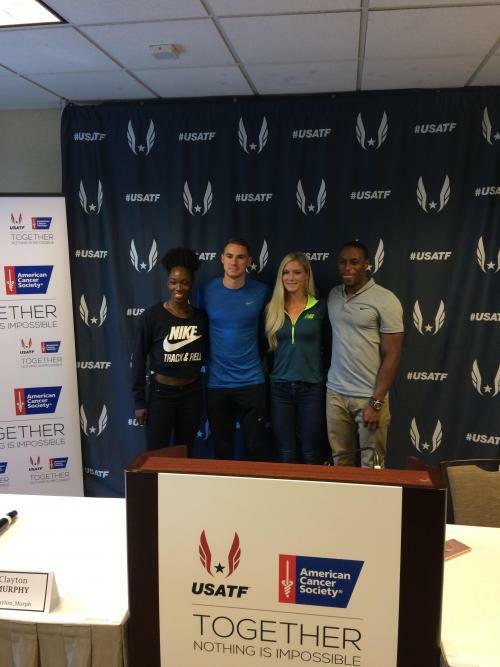 With a new pact recently inked among USATF, NBC, and Penn, the USA vs. The World concept - borne at the turn of the century - will march on for at least another 4 years. As Day Two dawned, Penn Relays athletes, coaches, officials, and fans were greeted by another gorgeous spring day in the City of Brotherly Love. While some may have complained that the temperature was a little warmish for the longer running events, no one could quarrel with the dominating sun, blue skies, and only an occasional light zephyr out of the south.